The rise of Ethereum over the last few years has given way to a lot of new and exciting blockchain projects, built upon the Ethereum network. Some of these projects have risen to significant prominence, including OmiseGO, the first Ethereum token to break a $1 billion valuation. Since then, OMG price has fluctuated with the rest of the market. You can read more about that in our guide on OMG price, or see our latest OMG technical analysis. This guide will tell you how to get your first OMG tokens, on the popular Binance exchange. OmiseGO uses the blockchain to reduce the world’s reliance on traditional, centralized financial institutions. The project is trying to create a platform that enables people to control their own assets, and instantly exchange between asset classes (Fiat, Crypto, and more) without the need for a centralized middleman. In doing so, OmiseGO will provide more convenience and operability for the banked population, and a new level of inclusion for the unbanked (such as those in emerging or developing nations). What makes OmiseGO most promising is their blueprint for scalability, using the Plasma framework, a similar concept to the Lightning network. The project is built by the company Omise, a digital payment provider operating in several countries in Southeast Asia. However, the OmiseGO network is built to be completely decentralized, and under no control of Omise themselves. The platform is essentially owned by its users and OMG token holders. Users who “stake” OMG tokens, holding over a specified amount in their wallet, will earn a piece of transaction fees charged on the network. Want to buy OmiseGo (OMG) tokens and start earning passive rewards? This guide will show you how. If you don’t already have an account, you will need to register. The registration process for Binance is very quick and open to people almost anywhere in the world. Before you can start trading, you will need to submit several verification documents. The process is again quite fast in most cases, compared to other exchanges. Additionally, protect your account by setting up 2-Factor Authentication. Few exchanges offer the ability to buy OMG with Fiat at this point. So if you aren’t already invested in crypto, or you want to invest more, the best option is to buy Bitcoin or Ethereum and then trade for OMG. If you want to buy either of these coins, you can do so with a credit or debit card from Coinmama or Changelly. Once you have BTC or ETH ready, you need to send the coins to your Binance wallet. To do this, log in to the Binance site and select “Funds”, then “Deposits”. Select the coin you are sending from the dropdown menu. Binance will show a wallet address to send to. Make sure you only send the specified coin to that address (i.e. BTC to the BTC wallet or ETH to the ETH wallet). Any other type of coin you send may be lost. Transactions are generally completed very soon after submitting, but depending on the network load it may take up to several hours. Once your transaction has been confirmed, go to the exchange section of the site. You can get here by clicking “Exchange”, then “Basic”. Now look for the search box on the right side of the page. Select the coin you wish to trade with, and type OMG in the search box. Select the pair that comes up (OMG/BTC or OMG/ETH). 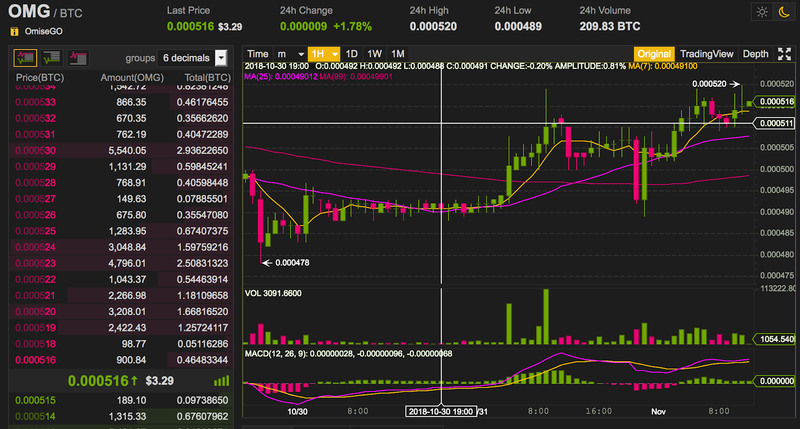 Binance offers a wealth of data, such as real-time analytic charts, trading volume and order history to help you make the right moves at the right time. They also give you the ability to set limit orders. This means you put in the price you want to buy (or sell) OMG for, and the exchange will automatically make your trade once the price hits this point. Find the box underneath the trading charts. In the “Buy” side, put in your desired price, or select “Market” to buy at the current price (this should be fine for novice traders). Next, put in the amount of OMG you want to buy. Alternatively, choose to spend 25%, 50%, 75% or 100% of your BTC/ETH held on Binance. Click the big green button to complete your order. And you’re done! The smart thing to do when you’re finished trading is to move your coins to a secure wallet, off an exchange. That way you can have full control over the security of your funds, instead of relying on an exchange’s security measures. For this, you will need a crypto wallet that supports the OMG token. MyEtherWallet is a trusted web-based wallet that supports all ERC-20 tokens, including OMG. The Exodus Wallet is a powerful desktop wallet for Windows, Mac, and Linux. Exodus supports a wide range of tokens and also has an exchange built in. For the highest level of security, it may be worth spending the money to get a hardware wallet such as the Ledger Nano S or the Trezor. Both of which support OMG. When you have your wallet ready, you can withdraw your tokens from Binance. To do this, go to “Funds”, then click “Withdrawals”. Choose OMG from the dropdown menu. 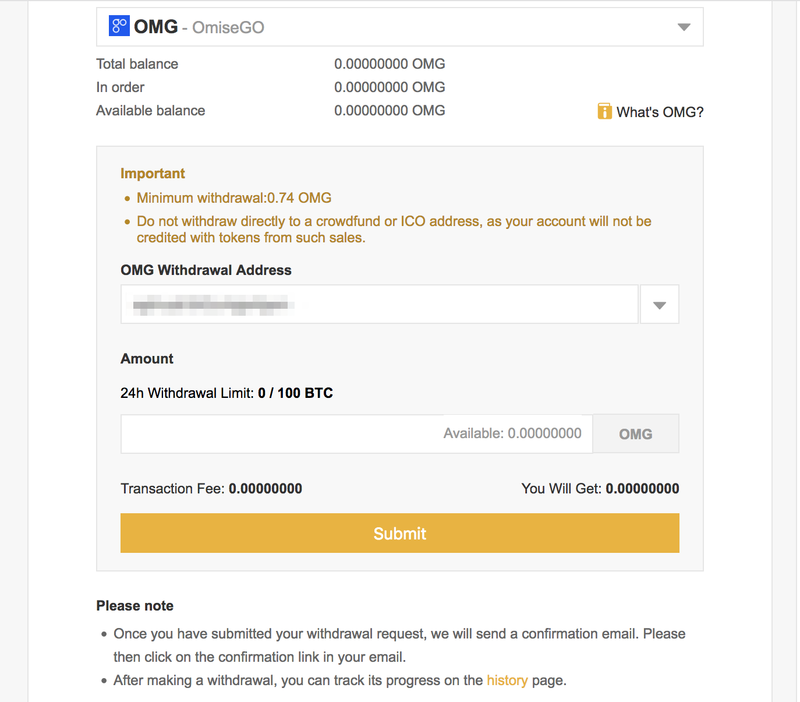 Now specify how many tokens you want to withdraw, and put in the address from your OMG wallet. Double check the wallet address is correct, and hit “Submit”. Once your transaction clears (it can take up to several hours if the network is busy), you are done! You’ve now finished the guide on how to buy OmiseGo (OMG) tokens. Enjoy!